A lot of the tips that you see regarding safety concerning hydraulic hose assemblies have to do with preventive maintenance and proper use. While many businesses go above and beyond to ensure that they are properly using their Fall River hydraulic hoses to create a safe work environment, others may be a little lax. The problem comes from people who have worked around hydraulics for many years. It is easy to forget about the serious injuries and damage that can be caused by hose failure unless you have seen it recently. The proper use of hydraulics is important to the safety of your crew and the integrity of your machinery. The more proactive you are at ensuring proper use of quality industrial supply and services, the better it will be for everyone involved. Before you do anything else, make sure that every component of your hydraulic system is fully checked for proper setup and operation. 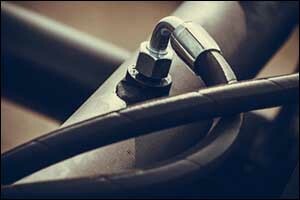 Never use components, such as hydraulic hose assemblies and fittings, that are worn or damaged in any way. Turn them into your local industrial supply and services center for repair or replacement, as needed. If you require custom Fall River hydraulic hoses, make sure to go to a reputable provider to ensure that you get the proper fit and that everything connects the way that it should. The next thing you need to do is to read the safety instructions. Nobody wants to sit there and read a safety manual, but it is a smart thing to do. Even if you have many years of experience working with hydraulic systems, the equipment you are about to use could be slightly different. There are different temperature and pressure requirements that must be adhered to and warnings that should be heeded. All operating instructions should be read and understood before you use the equipment. Check to see that all labels are legible and in-place on the hydraulic system to ensure that nothing is missed. Wear all safety gear, including protective clothing and safety goggles, during operation of any type of hydraulic equipment. In addition to understanding the instructions for use and ensuring safety rules are followed, it is a good idea to check the details before operating hydraulic equipment. For example, every single jack or ram needs to be fully supported on a solid and firm foundation. The foundation itself must be capable of supporting the load. Oil reservoirs must be filled according to the manufacturer’s specifications and should be done with the cylinder fully retracted. Fill to the recommended level – never over-fill the reservoir. Never use cheater bars or extensions on hydraulic jacks to raise a load. Ensure that the load is centered on the ram or that it is at least distributed equally on multiple rams. Improper loading can cause slippage and loss of the load. Be smart about making connections. All couplings must be fully engaged when making a connection using a quick coupler. Everything should be tightened securely and needs to be free of leaks. Go over all connections, including fittings and gauges to ensure tightness and a proper fit. Do not over-tighten connections, as this could cause other issues by distorting the fittings or by stripping out the threads. Double-check temperatures to avoid extreme heat, which can cause failure of hydraulic hoses and hydraulic hose assemblies. It is important to understand that hydraulic fluid is very flammable and can ignite if it is exposed to high temperatures. When under pressure, hydraulic hoses, couplings, and fittings should never be removed, disconnected, or adjusted in any way. Ensure that all pressure has been released before attempting any maintenance or adjustments. If you rely on hydraulic hose assemblies for your business, make sure to stop by our industrial supply and services center in New Bedford, Massachusetts. The more you are aware of the dangers associated with hydraulic machinery, the more likely you will be to adhere to industry standards for proper use of hydraulics. In addition to providing Fall River hydraulic hoses to customers throughout the South Coast region, we also sell a wide range of other industrial products. Gauges, gasket material, compressors, bearings, industrial belts, lubricators, pneumatic products, power washers, seals, and hydraulic power tools are just some of the things that you can find at our local store. Give us a call at 508-996-8400 to speak with one of our technicians or to place an order for custom hydraulic hose assemblies.